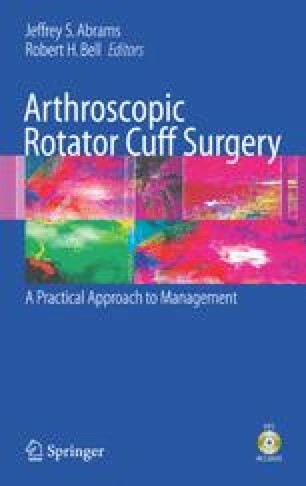 Routine and reproducible arthroscopic knot tying remains one of the most difficult skills for the novice arthroscopist to master when creating a stable rotator cuff repair construct. Despite recent advances in both suture welding and knotless anchor technology, arthroscopic knot tying still remains the most popular method of fixation when performing suture anchor-based shoulder reconstructions. Unlike open shoulder surgery techniques, arthroscopic knots are generally formed outside the joint with the suture already passed through the anchoring device and tissue to be repaired. Unfortunately, an endless number of combinations of knots (sliding vs. static, simple vs. complex, etc.) can accomplish this task. This further complicates an already confusing topic.